Tarpon are primarily a tropical inshore species fish, preferring shallow estuaries around mangrove shorelines, salt marshes or hard-bottom/seagrass communities and in our area the near-shore beaches. Tarpon can tolerate a wide salinity range, and as juveniles they can survive in fresh waters. The juveniles are available in our backwater creeks and impoundments year round and larger 100 to 150 pound class fish shadow bait pods off of the beaches of east central Florida during the spring, summer and fall. Tarpon have a distinctive dorsal fin ray that extends into a long filament, a large upward pointing mouth and very large scales, and they can gulp air and remove oxygen by means of lung-like tissue near their swim bladder. This “rolling” effect is one way to spot tarpon. 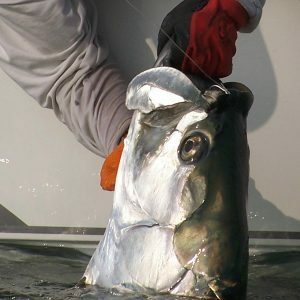 Anglers catch tarpon that weigh 40 to 150 pounds on average. Tarpon do not mature until 7 to 13 years of age and it is believed that they spawn offshore between May and September. In our region of Florida the juveniles can be caught on both light tackle and fly in the backwater estuaries, creeks and impoundments with the larger fish targeted off of the beaches fishing with 20-pound class tackle.